Hire me to speak at your company or book club. You will be doing your part in my life by accepting my message, acknowledging my vision and allowing me to give of myself to others. 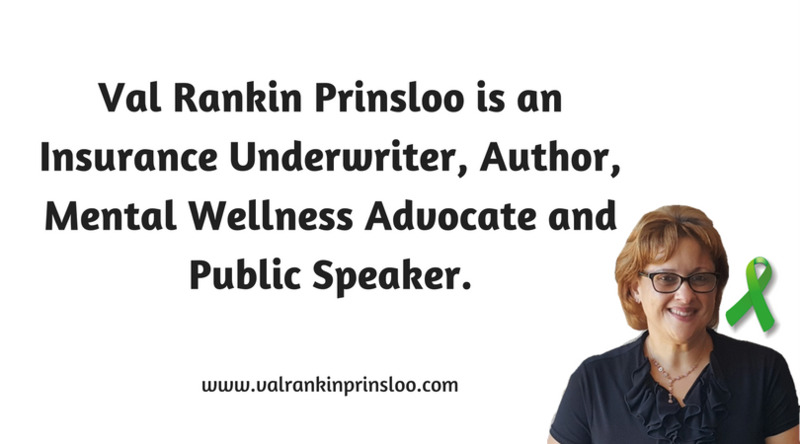 Mental Wellness Advocate and Public Speaker. VALLEY OF VICTORY is a Non-Profit Organisation (NPO) that was founded in 2016 on the principles of supporting early intervention and prevention for those individuals, family and community members who are at greatest risk of serious mental illnesses; their families and friends. This stemmed from area of a personal victory of Val Rankin Prinsloo where she moved from dysfunctional mentally ill to highly functionally well. She has divided and continues to conquer in the area of personal mental health. Corporates who provide a platform for Val to deliver a message bridging the gap on mental wellness across society and corporations, will be engaging in social responsibility. The mind-set shift should filtrate from the company Human Resources down through all the levels of the company. This message would then eventually make its way down to the ordinary man on the street. The idea is to create a lasting mental awareness in society or an organization and all those whose lives they touch. The bonds of societal stigma and public misunderstanding of mental illness need to be broken. Her wish is to provide information by sharing first hand experiences, we can support ourselves and others living with Bipolar Disorder, Depression and related mental illnesses. Mental wellness is a foundation on which many other things can be built. Mental Health disorders and behavior continue to be under diagnosed disorders or not detected and individuals continue to show symptom without the understanding. In general, these can go undetected for long periods and may have a devastating effect on individuals, family and society. 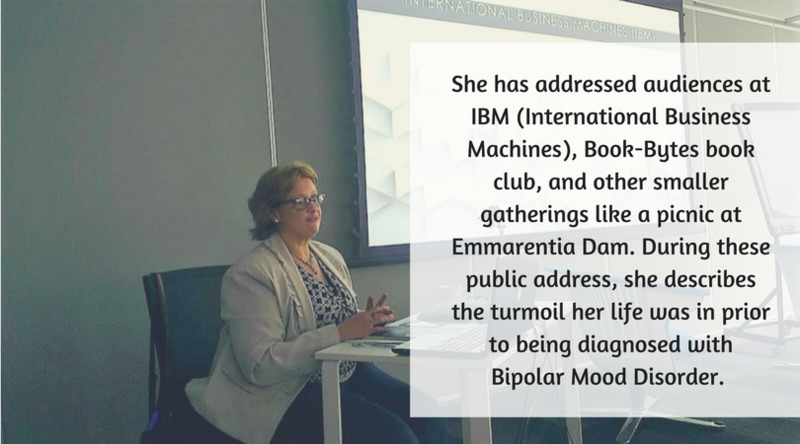 She has addressed audiences at IBM (International Business Machines), Book-Bytes book club, and other smaller gatherings like a picnic at Emmarentia Dam. During these public addresses, she describes the turmoil her life was in prior to being diagnosed with Bipolar Mood Disorder. She also describes her family life dealing with an untreated mental illness. She recognizes that mental illness cuts across all social, economic, age and gender lines. Mental illness touches the lives of many and knowing how to identify when someone needs help, and also when and where to get it and give it. We can all help out communities be a better and safer place to live. As part of larger company and corporations social responsibility, funds could be donated via the NPO to reach disadvantaged communities where the misconception is often that those afflicted by mental illness are either bewitched, demon possessed, have past sins they are attaining for, untreatable, unable to work, criminals, need to be committed to mental institutions, dysfunctional or disturbed. 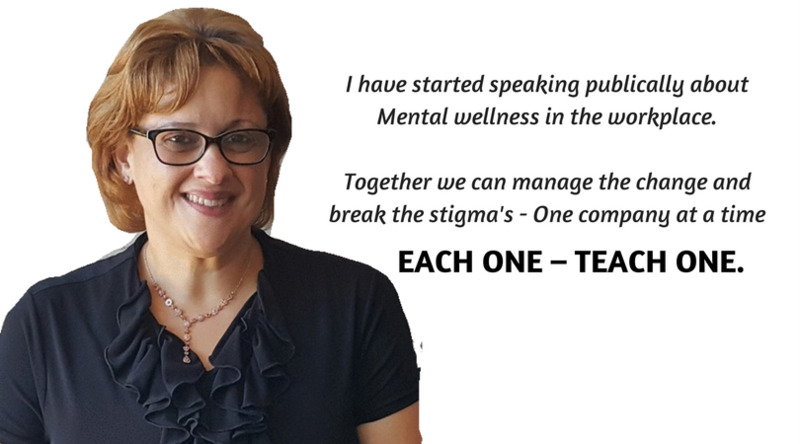 Val is passionate and purposeful in every endeavour breaking the stigma around Mental Illness and Wellness.